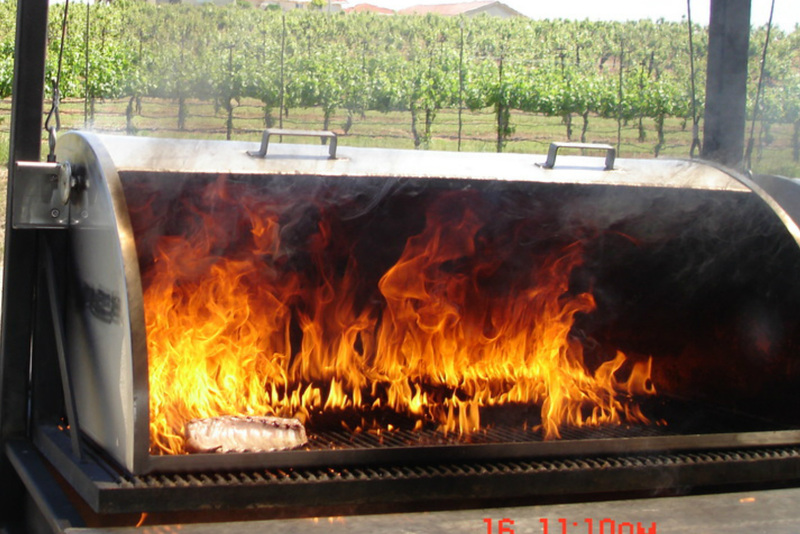 A pic from May 16th 2010 at Jeff Runquist Winery in Amador Ca.........................Just cleaning the grills by Fire and Charring a Rib-Eye! ​ ASADOR...For over 35 years! Welcome to the WOOD, FIRE and SMOKE SHOW!!! Recognized by Sacramento Magazine (Nov. 2015) as One of Sacramento's Top Caterers!! Welcome to WFS! WFS Specialize's in Upscale, Entertaining and FUN Open Pit Wood Fired and Smoked BBQ Events! The first thing I would like you to understand is I DO NOT BBQ like the other guys!! As you read on you will see what I mean! On my site you will see options, not another limited BBQ menu. We DO NOT put meat in a foil pan, cover it w/bbq sauce, then wrap it in tin foil and tell you that it is "the best bbq"!!! At WOOD FIRE SMOKE BBQ not only are we known for our endless sourcing for providing the Freshest, Best Top Graded Prime cuts of Meats and Vegetables, but, for our Showmanship and Interaction w/people at all of our Events. You are Invited and Welcomed to come be part of the Fire and Smoke Show Experience!! We Love having people come down to the Trailer to watch and the Party Banter that takes place while we create the meals. We believe in everyone being part of the "Show"!!! We do this because we Love making our Events something everyone will go home and share w/their friends what a Great, FUN, experience they enjoyed with us. We are very grateful for all of the accolades and applause we have received from people attending our Events and have made many, many wonderful new friends. The great part about BBQ in California means there is no one style or way of BBQ. I do not believe in placing limitations on BBQ! Have you ever noticed when BBQ "Experts" talk about BBQ they rarely mention vegetables? I am a big backer of the CHAR-Evolution, as well as Smoked Meats and Vegetables. As you can see, in most cases, our food is served in a rustic manner. Picture Seasoned, Charred, Crusted, large cuts of juicy meat (Primal Cuts) served on large wooden boards w/Charred/Smoked garden Fresh Vegetables riding along side, being served to you, your friends and family! I also believe in having the right BBQ "Toys" to create an exciting environment at Events. Besides the WFS BBQ Trailer, I, also, have a large portable Rotisserie that can hold 2 Pigs or Lambs/Goats or 15 to 20 Chickens and two 40lb. "Chapa's". What's a Chapa? It is a Spanish term for griddle. The Chapa is 3'x3.5' and does an incredible job with vegetables as well as meat. I work for you and will work with you to create an exciting menu that fits your event. The size of the event doesn't matter as long as it is FUN! I love what I do and the attention to detail you receive is far superior than the others. Think about it, what is more FUN than having your guests and friends arrive to see my WFS BBQ Trailer and Rotisserie Fired up at your event !! Before your guests have even sat down or had their first drink they are already excited and ready to Party! Presentation is King! I have an extensive Food and Wine background and have created many delicious Wine/BBQ Events at homes, at Businesses and (as the photo's show) my specialty, Winery Events. Having done this as a side business and a hobby over the years, In 2012 decided to start my own business. I had just retired after spending 15 years as a Retail Ops Regional Manager and then the last 17 years as a Corporate Fraud Investigator traveling the western half of the USA to prosecute internal criminals. Sadly, all plans were delayed as I cared for my wife Anne who lost her 10-year battle with breast cancer February 2012. Because of that battle, portions of all my events will go towards breast cancer charities in her name. Thus, I also make special discounts for events involving breast cancer and personal events for survivors. With over 30 years of experience and a huge list of options we can create your perfect "Big Meat" event!! Let the fun begin! And most of all THANK YOU!! "Los Asesino's De Vino Y Carne!!!.....Gracias!! Contact us at woodfiresmokebbq@gmail.com or 916-834-2876 TODAY! We come to You! After much time and research I had this trailer built the way I wanted it. 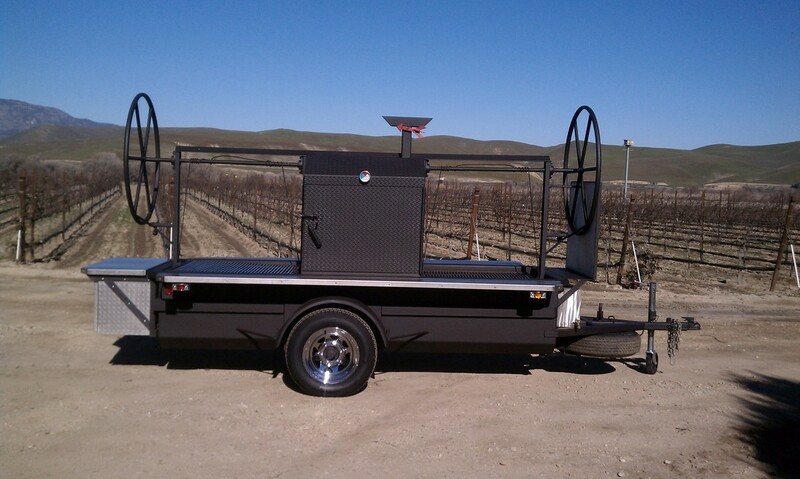 Let our WFS BBQ trailer help provide some special occasions for you. 22 feet long with two 4x6 open wood fired pits and a huge smoker box that's 4x5x6 we can do big or small events.